Anuja Menon picked up her first Louis Vuitton handbag when she was on holiday in London in 2008 - and has been hooked to the French luxury brand since. Today, the young Mumbai lawyer's wardrobe is filled with Louis Vuitton scarves, stoles, cufflinks, sunglasses and handbags. Her prized possession: the classic Speedy 25, a compact city bag associated with style icon Audrey Hepburn. "I would not buy expensive things without any reason. I buy them for indulgence or for some special occasion," says Menon. Louis Vuitton may be a brand once associated with royalty in India. But, today, it is betting on millions of upwardly mobile Indians such as Menon, who have oodles of cash and plenty of style to match. Tikka Shatrujit Singh, advisor to Louis Vuitton India, says people with old money always knew about the brand, but the challenge was to reach out to new clients such as young professionals and entrepreneurs. "It's the most exciting segment. There are several young individuals making Rs 3-4 lakh a month," says Singh, who has been associated with the brand since 1999. "We have a lot of focus on this segment. In the next five to 10 years, they will comprise the majority of our customer base. They will be the game changer." The company opened its first India store at New Delhi's Oberoi hotel in 2003; today, it has five stores in the country. In many ways, it was a trendsetter in the luxury sector in India. Soon after its entry, several big names such as Giorgio Armani, Gucci and Salvatore Ferragamo also set up shop in the country. Louis Vuitton India's product line - accessories, jewellery and travel-related goods - starts at about Rs 25,000 and can go into lakhs of rupees, but it still remains one of the top luxury labels in the country. It sells most of its international line in India with the exception of ready-to-wear clothing, but women's handbags are the clear leader. Women account for a large part of its revenues, although the number of male customers is also going up. 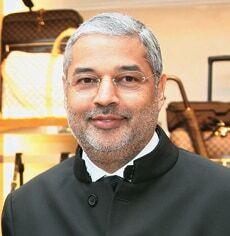 Louis Vuitton sees one-third of India's middle class as potential customers. "We are looking at a population of 100 million. Even if we get 50 per cent, it's huge," says Singh. In order to woo this segment, Louis Vuitton India regularly organises exhibitions with top artists. For instance, it supported sculptor Anish Kapoor for his art exhibitions in Mumbai and Delhi in 2010. Louis Vuitton's link with India is almost a century old. The company used to make special trunks and luggage for the maharajas of Jammu & Kashmir, Bikaner and Baroda to carry their suits, achkans, turbans, shoes, swords and typewriters on long journeys. Interestingly, Singh's great-grandfather, the maharaja of Kapurthala, Jagatjit Singh, expressed his revolt against British rule by opting for the French brand. Founded in Paris in 1854, Louis Vuitton started with travel products, but metamorphosed into a fashion and accessories powerhouse over time. Today, it is French luxury group LVMH Moet Hennessy Louis Vuitton's flagship brand; the group has a portfolio of more than 60 brands including Thomas Pink, Fendi, Kenzo and Bvlgari. 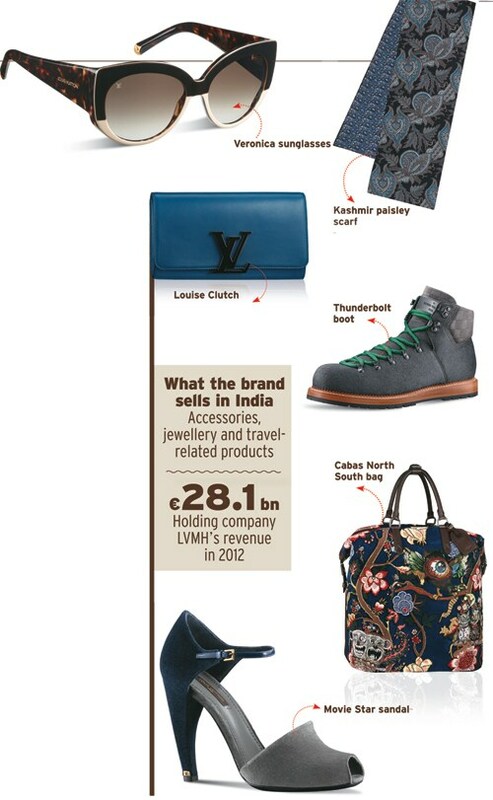 In 2012, LVMH's revenues grew 19 per cent to i28.1 billion on the back of a rise in global sales. Recently, Louis Vuitton was ranked number one by research firm Millward Brown in a list of the 100 most valuable global brands. Indians have also been splurging on Louis Vuitton products. The brand has recorded double-digit growth in the past 10 years and the company says it is making a profit in India. "We wouldn't be re-investing if we were bleeding," says Singh. But Ritu Rana, CEO of Luxury Hues Consultancy, says the company has a limited product range in India. "Louis Vuitton seems to be in wait-and-watch mode in India. In China, they are slowly phasing out monogram bags, but in India monogram bags are still played up significantly. The company needs to evolve with the customers because they are always travelling," she says. The Indian operations are still a relatively small part of the parent company's global business. Its expansion plans are crimped by lack of luxury retail space in the country. Its India store count is way below China's 45 and 116 in the US. Singh says high real estate prices in India are to blame. "It is 50 per cent less expensive in China," he adds. There are other problems such as India's high import tariffs compared with Dubai and Singapore. Also, foreign investment norms on single-brand retail allow foreign players to own 100 per cent in a venture only if they source 30 per cent of their products locally. Louis Vuitton's entire portfolio comes from France. "Many brands have not entered India because of this particular clause," says Neelesh Hundekari, partner at consultancy AT Kearney. Louis Vuitton India does not sell ready-to-wear clothing partly because of its small stores. The average store size in India is 3,000 sq ft, significantly lower than stores abroad, which range between 6,000 sq ft and 15,000 sq ft. But that is not the only reason. The company has learnt that affluent Indian women prefer traditional clothes such as sarees or salwar kameezes made by local designers. So, Louis Vuitton focuses on accessories that can complement traditional clothes instead of competing with them. Nevertheless, Louis Vuitton India is looking to open more stores, especially in Kolkata and Hyderabad. Singh says the fashion house is now looking at going beyond just hotels. "In Mumbai, because there's nothing available, we are in hotels. We don't want to go to hotels just to have a presence. The visibility and footfall are lower in hotels than malls. If you get 10 clients here, you get 1,000 in malls." Perhaps India is the final frontier to be cracked open by the luxury giant.